Philadelphia 76ers guard Markelle Fultz warms up before game two of the first round of the 2018 NBA Playoffs against the Miami Heat at Wells Fargo Center. Basketball returns to the Philadelphia sports calendar tomorrow, and normally you'd expect an NBA team to be settled in before the season starts. That's not really the case for the Sixers — they had to hold night practices upon returning from a trip to China to help ease their players back into their home time zone, and injuries have created question marks throughout their rotation. But the biggest mystery, as it has been for the last 13 months or so, is what to expect out of second-year guard Markelle Fultz. Brett Brown made the surprise move of throwing him into the starting lineup to start the preseason, and the subsequent results have given supporters and doubters plenty of ammunition on both sides. 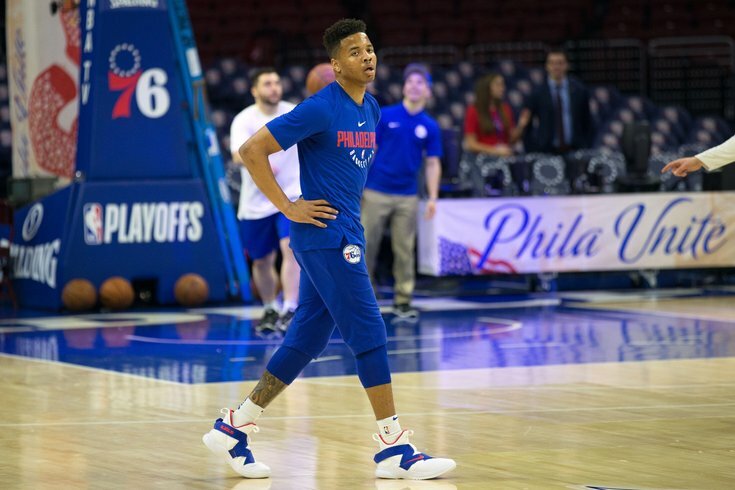 As other members of the media have noted, the team has begun its own softening on Fultz, revealing that he may come off the bench in the second halves of games. While I discounted that thought when Brown first discussed it in China as a situational move, hearing Brown talk about it at this past Friday night's practice made it seem a lot more real. "It is [what I'm leaning toward]," said Brown. "I'm [starting him] because I want to grow him, I want to grow us. And can that help us? I believe that it can. And I think the decision to like, why don't you do that again in the second half, I'm trying to get him as many minutes as I can as a point guard. And I can better do that with the way I've just spelled it out if I'm committed to starting him. And I am, I want to see how this goes." This seems like a lot of doublespeak to me. It's possible to grow Fultz as a point guard in a lineup with Ben Simmons, because Simmons is big enough to be used as a weapon in the post or as a roller in a pick-and-roll. Yes, Fultz can get those reps exclusively if you bring him in for Simmons straight up in the second half, but that ends up defeating the purpose of starting them together to begin with. And that is at the heart of the issue for the Sixers in this situation. The path forward isn't clean no matter what they do here, and this situation threatens to throw the year off-kilter once again. There has been a pretty high level of sympathy for Fultz as he has gone through his public struggle, and on the whole that's a positive development in a famously impatient town. But there can be no sugarcoating how important Fultz is to the long-term viability of this franchise, for reasons connected to the past, present and future. The stakes of the trade with the Boston Celtics become clearer every day. It is easy to look at the Sixers and believe they could have the two best players in the rivalry moving forward, but the fact remains that they are still playing catch-up. Boston currently has a better team than the Sixers, and the Celtics still have direct and obvious paths toward acquiring more stars. The Kings pick Philadelphia is likely to sacrifice next summer (it's top-one protected) is a huge trade chip, and at worst is another swing at stardom for Boston in the lottery next summer. While the Sixers have cap space to use in free agency next summer, a lot of options are drying up before they get there. Klay Thompson has openly expressed his desire to stay in Golden State. Kawhi Leonard seems a lock to stay put or head to L.A. Kevin Durant's eyes are unlikely to wander to Philly. Kyrie Irving is committed to the Celtics. The team has no interest in Jimmy Butler as far as I can tell, and the options really begin to dwindle in stature from there. As good as Simmons and Embiid are, the Sixers are in need of a third star, or at the very least a high-end player who can self-create. Their cap space will dry up after next summer, leaving a leap from Fultz as one of the only feasible paths to a star that doesn't involve shipping out important contributors in a trade. Even in a world where Fultz doesn't become a star — and that's a reality Philly fans should already be prepared for, given how things have unfolded to date — they do need him to at least be congruent with their best players. And the best way to do that is to play him as many minutes with the locked in core as they can, night in and night out. Shooting is where everyone's mind drifts when it comes to fitting Fultz in next to Simmons, but taking and making open shots is the most natural part of that progress. The two ball-dominant guards need to learn how to thrive more without having the ball in their hands, something Simmons struggled to do at times when Embiid had the ball in the post last year. Those are reps and tendencies that can only be learned if they're on the floor together. So the case to play Fultz is quite clear: the Sixers have a ton riding on whether he pans out, and more than I think people seem to think about at the moment. Brown himself has admitted to reporters that thrusting Fultz into this position will come with issues and that they have to live with them on their path to improving on last season's finish. How do we deliver a team to the end of April and May — and we sure hope June — that's better than when we started? You may have to experience some pain along the way as you rotate the team. This is going to take a little time. This isn't like perfect world fits. And I like it, because what they are is really good players, and they're really young...I have to make the decision of how to best play it and how do you build a team, and how do you really put us in a position where we can make a deep playoff run, and we can be better than we were last year. All those things are what's been thought out as it relates to this question of how it relates to playing the team. But there is a real cost to what Brown is about to do. It doesn't take a basketball genius to point out the shooting concerns Philadelphia's new starting lineup will have. When Embiid is being counted on as one of your top three shooters on the floor, you find yourself in a serious bind on a modern NBA floor. The Sixers are replacing one of the best shooters in NBA history with a player whose jumper mysteriously disappeared last season. By starting Fultz to kick off the preseason and committing to Fultz joining the other members of the core in the starting unit, Brown has made a commitment that is pretty hard to come back from. Fultz will now have to sink or swim, and if he sinks, the only real recourse for Brown to right the ship is to demote him to a smaller role as a bench player. Philadelphia's approach dating back to last season has been to empower Fultz whenever possible as he has gone through his struggles. They left him out on the court in front of the cameras last season, multiple sources told PhillyVoice at the time, because he insisted on being out there. They have thrust him into the starting lineup, Brown told reporters at the opening preseason game, because they wanted to reward his strong play to open training camp. Empowering a young player who went through a public crisis last season is admirable, but it's certainly debatable whether it is or was actually the best thing for Fultz. Brown was happy to talk up his pupil during interviews at Summer League or before we were able to see his jumper in action, and the closer we get to the regular season, the more it sounds like Brown and the team are trying to hedge. Asked by the morning show crew at 97.5 The Fanatic what fans should expect from Fultz this season on Monday, Brown's immediate retort was fascinating. "They can expect they're going to look at a 20-year-old. They can expect they're going to look at someone that hasn't played a second of NBA basketball," said Brown. "And there is a reality check we all have to live under that the excitement of the first player chosen — which sometimes puts additional pressure or expectation, and we get it — but the reality of the situation is he's young. And I'm going to try to play him the large majority of his minutes with the ball." That doesn't sound like a quote from a man who is seeing his young guard move closer to viable NBA starter, or viable member of a crunch-time group. In spite of all the reinforcement of his place in the team over the last year, in spite of an offseason dedicated to shooting reps, his three-point shot was still absent outside of one game against the Magic in the preseason. Brown has also made it pretty clear Redick starting the second half will be part of their usual routine, scaling back Fultz's prominence before the season even begins. The team has dressed it up as offering a different look and growing him as a point guard, but it feels more like a way to get the old starting five more minutes without inviting scrutiny from removing Fultz as a starter. So what happens if the Sixers have to move Fultz to the bench? We can debate the impact of all the various reasons his shot was jacked up last season, but we can't ignore the mental component here. His own trainer this summer called the problem "the yips." Members of the organization have brushed that away publicly, but have offered platitudes about how anyone would be impacted mentally after going through what he did. Fultz himself has insisted it was a physical issue at every opportunity, though that seems incongruent with deciding to stay in Los Angeles for most of the summer to work on your jumper with a trainer. Empowerment is great until you're faced with a decision of possibly needing to stop empowering an individual for the betterment of the group. Bringing him along slowly from the bench until he was ready was the safe route, and the Sixers decided against that. Now, both Brown and Fultz will have to answer constant questions about what his place in the lineup means and will have to juggle that on top of adjusting to the rigors of the NBA. It has been taken for granted locally that the Sixers will be a top-three seed in the East again this year, and Brown has even suggested he doesn't much care about that as much as he cares about what they do once they're in the postseason. But there will be jostling for turf in the East this year, and experimenting with Fultz could impact the race. The Milwaukee Bucks made a significant addition this offseason by going out and hiring former Hawks coach Mike Budenholzer. Even if he does nothing aside from installing a more modern offense, the Bucks will likely take a step forward this season and put themselves in the mix in the tier behind the Celtics and Raptors with the Sixers and Pacers. Last year, a grand total of 4 games separated the East's three seed from the fifth seed. Philadelphia needed a monumental winning streak to claim their 52 wins and the third spot and can't bank on doing that again. I don't think the Sixers are in much danger of falling to fifth as long as they're healthy, but there is a difference between having to play Toronto and having to play Boston in a potential second-round series. That difference starts with Embiid — he has shot seven percent better from the field against the Raptors compared to the Celtics in the regular season. That's no small number when the games slow down and every possession takes on greater significance. The expectations are also much different for the Sixers this season, following Brown's preseason proclamation that the Finals are their goal and last season's unexpected surge to 52 wins. The pressure is on the coaching staff and the players to deliver this year, and it's easier for Brown to talk a big game about development than it will be to hold onto this starting group if Fultz struggles. Yes, it is possible that Fultz will figure this all out and help lead the team to new heights. He is talented enough to be a helpful contributor regardless of whether that shot comes or not. But the Sixers did not draft him No. 1 overall (and pay an extra price to do so) for a contributor. They wanted a star. And there are warning signs that not enough has changed from last season. Outside of the Magic game in the preseason, Fultz attempted just a single three, and there were opportunities with space on the perimeter that turned into him barreling into traffic in the paint, trying to force much tougher plays. Philadelphia's starting five last season was one of the most productive five-man groups in the league from the moment they reconfigured early in the season. Brown may be thinking about the long-term, but we have seen him follow a coach's instincts before, most notably when he removed Fultz from the playoff rotation altogether last year. The Sixers are walking a razor's edge here, trying to develop a third star internally without undercutting or offsetting the impact of their readymade stars. They will be taking the ball out of the hands of two players whose talent is effervescent because they have invested trust and resources in last year's No. 1 overall pick being the piece to put them over the top. They are shaking up a group that exceeded all expectations last season and replacing a reliable veteran with a strangely-fitting piece. They had better hope that faith is not misplaced.